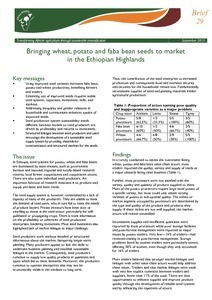 In Ethiopia, seed systems for potato, wheat and faba beans are dominated by state entities, such as government bureaus and national, regional and locally-based research centres, local farmer cooperatives and cooperative unions. There are also some individual seed producers. An important function of research institutes is to produce and supply pre-basic and basic seeds. The seed supply system is, however, constrained by a lack of capacity of many of the producers. They are unable to meet the demand of seed users, who in turn fail to meet the needs of produce buyers. Private investors have been slow or unwilling to invest in the seed sector, particularly for self-pollinated or propagating crops. There is scant information on the profitability or otherwise of seed production enterprises, hindering investment. Most seed businesses also highlighted lack of market linkages as major challenge. Using improved seed varieties increases faba bean, potato and wheat productivity, benefiting farmers and traders. Enhancing use of improved seeds requires stable seed systems, capacities, investment, skills, and markets. Addressing inequality and gender relations in households and communities enhances uptake of improved seeds. Seed production system sustainability needs different business models so seed producers are driven by profitability and returns to investment. Structured linkages between seed producers and users encourage the development of a sustainable seed supply system by providing channels for communication and structured markets for the seeds.